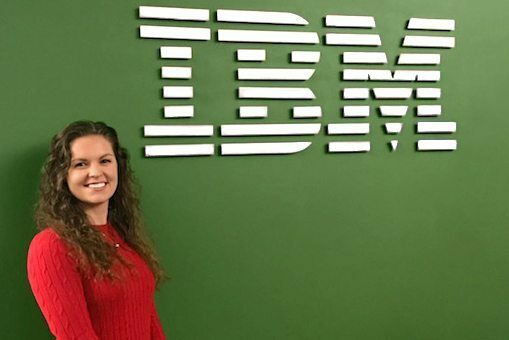 Destiny Dux ’16 has only worked at IBM as a financial data scientist for a few months. But after making presentations at work, she’s received the positive feedback that she sounds like a seasoned professional. She owes it all, she says, to her finance and data analytics and business intelligence courses at Saint Mary’s, particularly her business strategies course. “I don’t think there is any course at any other college that is as strenuous and helpful as the business strategies class offered at Saint Mary’s,” she said. “Every few weeks we presented a different business plan to a panel of judges who were supposed to represent the most difficult group of individuals we will ever face in our career. It was nerve-wracking, frustrating, extremely challenging, and yet, it was my absolute favorite course. It prepared me in every way possible for presenting complex subjects, conflict resolution, and handling frustrating situations that may arise when working with a group of individuals. “The skills I developed from this course have set me apart from my peers and have helped me to quickly advance in my career at IBM. I have had multiple training courses at IBM, and every single time, it was noted that I spoke confidently and professionally, didn’t waiver, and it seemed like I’d been doing this for years,” she added. As a freshman Dux, a Winona native, thought she would major in actuarial science; then she switched to piano performance. In total, she considered nine different majors before Saint Mary’s began offering the business intelligence and data analytics major. “This major was a perfect fit for me,” she said. “I learned math before I could read. I also love computer science, technology, and the statistical emphasis.” Not surprisingly, Dux never hesitated to dive into a male-dominated field. She most loves the independence that is associated with her position. Working in a repetitive role has never appealed to Dux. “My job really matters and that pushes me to learn and to grow and to prove myself,” she said. “The challenge of this position is really pretty exciting.